I feel very strongly about this subject. It is a national disgrace that this problem exists in such staggering numbers. According to the national Council on pet population study and policy, it is a widely accepted fact that 9.6 million dogs and cats are euthanized annually in the United States. If we were to equate one dog to one person that means we would eliminate the entire state of Michigan yearly. Only 25% of dogs and 24% of cats that enter animal shelters are adopted, only 15% of dogs and 2% of cats that enter shelters are reunited with their owners. More cats are euthanized than dogs because they are more likely to enter a shelter without any owner identification.Kitty name tags! Even though those figures are staggering I want to look at this on a ONE–TO–ONE basis. SHOULD I BREED MY DOG. Take a look at the AKC approved chart the green one to the left, and if you get any no’s you should spay or neuter your pet. Let’s take a look at each box in this decision flowchart. The first consideration should be is your dog a pure bred dog. Now I know a lot of really great mixed breeds or what we call American bred dogs. The vast majority of those dogs have responsible owners and they have had these wonderful animals spayed or neutered. You should only consider breeding your dog if your dog is a pure bred and your goal is to improve the breed. Let’s continue with the decision making process. Where did you get your dog? A pet store, an animal shelter, you found it, your neighbor gave them to you, or God forbid you got it from a puppy mill. These dogs get a no and should be spayed or neutered. Did you get it from a breeder if so then that’s a yes. Continue onward on the decision making chart. Did you get a 3 to 5 generation pedigree with your dog? 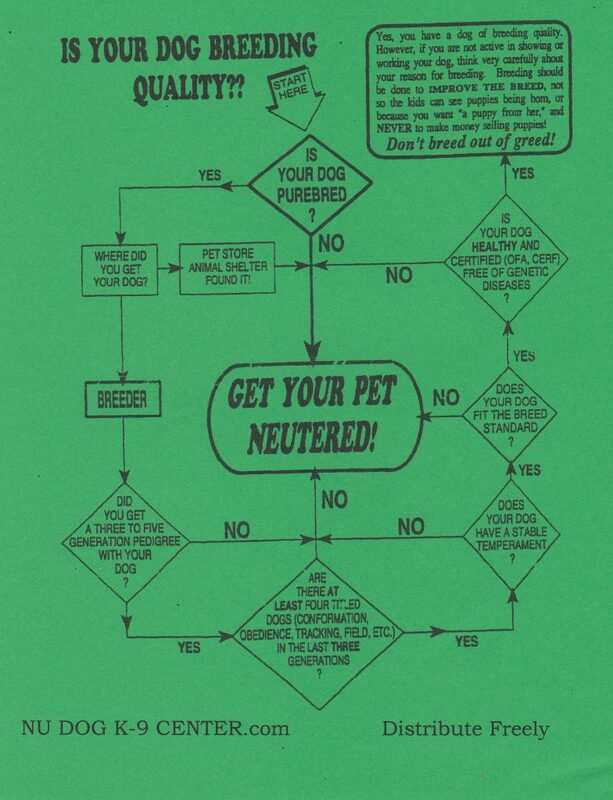 If the answer is no, get your pet spayed or neutered, if your answer is yes go on to the next decision box. Are there at least four titled dogs, (confirmation obedience, tracking, field events, or any performance venue) in the last three generations? If no, spay and neuter your pet. If yes go on to the next decision making box? Does your dog have a stable temperament? If you have any doubt about this last decision take the dog to a professional trainer and get their opinion.Having a professional opinion will bolster your own judgement. The probable answer is no, get your pet spayed or neutered. Does your dog fit the “breed” standard? If no then spay or neuter your pet. If yes go to the next decision making box. Is your dog HEALTHY, and had all his “CERTS” which is short for all of the certifications that you should have on your animal before you consider breeding. These are OFA (Orthopedic Foundation of America) for his hips and elbows and certification for his eyes, heart and free of any genetic diseases that may be indicative of your particular breed. If the answer is NO, then spay or neuter your pet. If the answer is yes however you have made it to the final decision box. Okay so you have a dog of the breeding quality. If you are not actively showing or working and competing with your dog think very carefully about your motives for breeding the dog. Breeding and I quote “should be done only to “IMPROVE THE BREED”. Invalid reasons are, so the kids can see puppies being born, or because you want a puppy out of her, and never, NEVER to make money selling puppies. Don’t BREED out of GREED! Now is the time to for some information from you. Is your pet neutered or spayed? How old were they when they got the procedure? Did you have any medical issues? Or Just a reply on this post. Reach out to me, I love to “chat” about dogs and dog training.